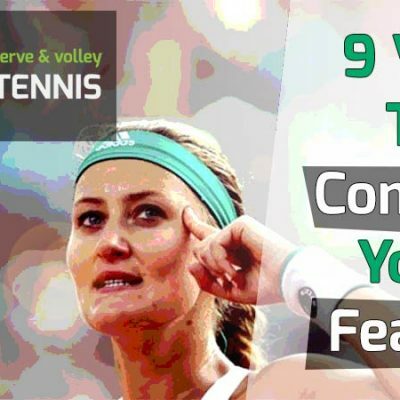 Home » Theory » What Are The 8 Basic Tennis Shots? The game of tennis might seem complicated for those new to it, but it can essentially be broken down into 8 basic shots. All 8 shots need to be mastered to excel and proceed to the higher levels of tennis. 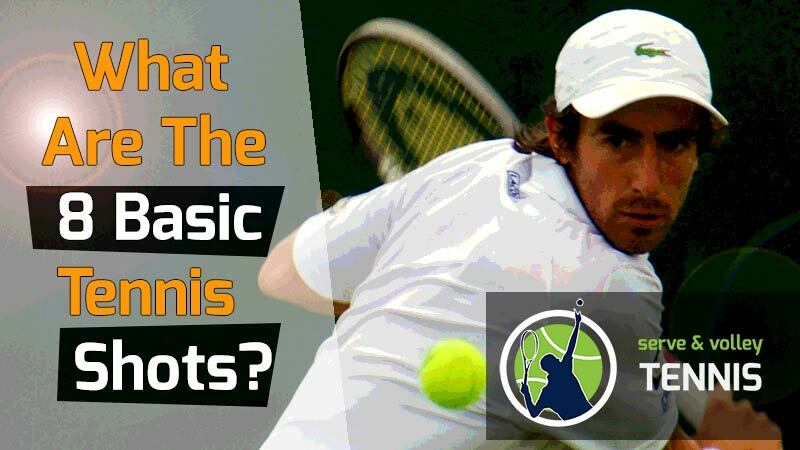 In this blog post, I discuss all 8 basic shots in the game of tennis. By the time you finish this article, you’ll know all of them inside and out. You’ll also have a much better understanding of the game of tennis. Most tennis newbies wonder, “What are the basic strokes in tennis?” Well now you know. And by knowing all the basic strokes, you can learn them and use them in your own game. This will make you a more versatile and dangerous player to face. It’s ironic, but I see club players with decades of experience who never utilize all 8 shots in their game. I believe there are a lot of players out there who never quite learned some of them, so they just don’t use them. 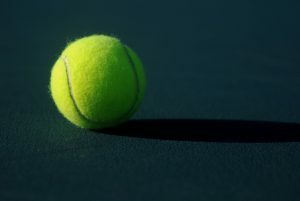 If you’re new to tennis, I implore you to learn all 8 basic shots. 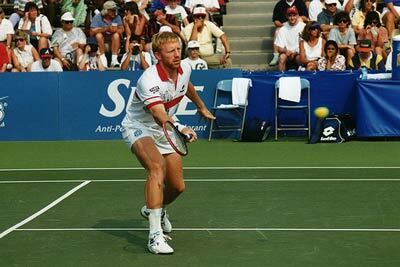 Certainly, the forehand, backhand, and serve are essential to playing tennis. Other shots, like the slice and dropshot, are not part of the arsenal of some club players. I honestly don’t know how they cope in tennis without a slice. To me, the slice on both the forehand and backhand wings are a must-know stroke. Without more talk, let’s get into the details of each stroke, so you know what each one entails. The forehand is the most basic and often-used shot in tennis. It’s also the easiest to learn and the shot beginners pick up the quickest. Think of the forehand as akin to the queen in the game of chess. The forehand is your most versatile shot. Good players can hit with power, spin, and place the ball where they want. 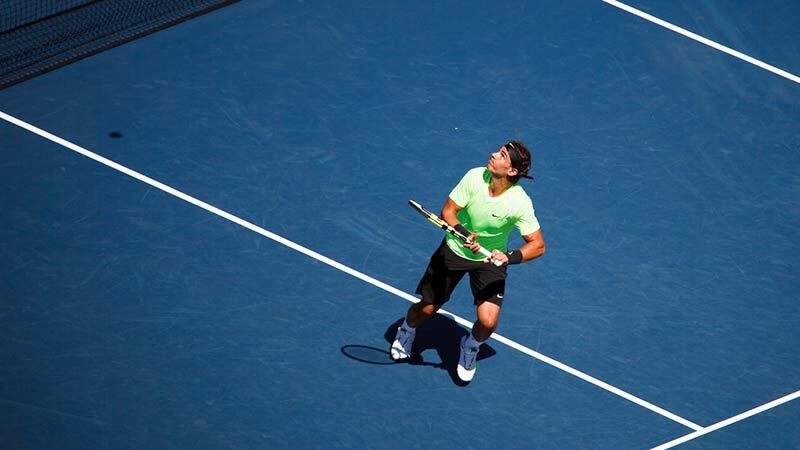 Being the most basic stroke in tennis, it’s often the one everyone learns first. 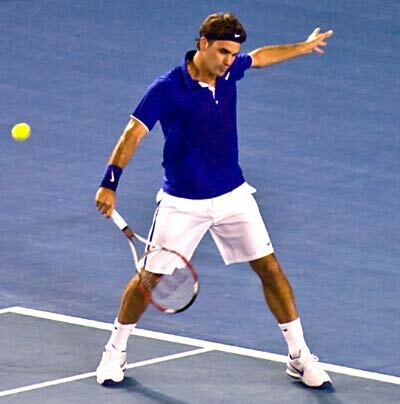 Professional players can dominate matches primarily with their forehand (a la Roger Federer). The strength and placement of the forehand is often what separates great players at the highest levels. In my experience, the forehand is the most comfortable shot to hit and the most enjoyable too. The forehand is hit on the dominant side of your body and is typically struck with one arm (your dominant arm). It’s possible to hit a two-handed forehand as well, but I would estimate less than 2% of recreational and professional players use it. On the men’s pro tour, there have only ever been two players to use the two-handed forehand. And this is out of thousands of players since 1940. Those two players are the legendary Pancho Segura, and more lately, Fabrice Santoro. Segura was a lot more successful than Santora but played in the 40s and 50s when the game and racket technology was a lot different. Santoro played in the 90s and 2000s. He reached a career high of 17 and his best result at a major was the quarterfinals of the 2006 Australian Open. On the women’s side, the two-handed forehand had much more success, with players such as Monica Seles (10 career grand slam titles) and Marion Bartoli. Bartoli won Wimbledon in 2013 and then promptly and unexpectedly retired. She was my favorite woman to watch. 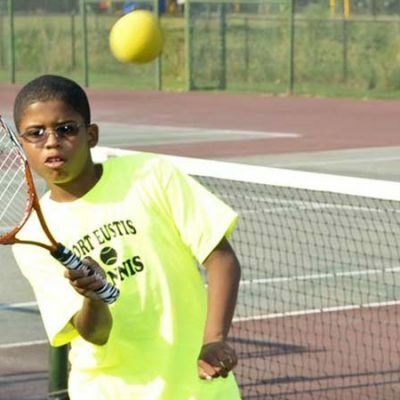 If you’re just starting out in tennis, hire a qualified pro to teach you the basics of the forehand. With just a couple of lessons, you’ll at least know the correct technique. If you can’t afford lessons or don’t have a qualified pro near you, you can check out my youtube channel for free forehand lessons. The backhand is hit on the non-dominant side of your body. For example, if you’re a righty and strike the ball on the left side of your body, it’s considered a backhand. 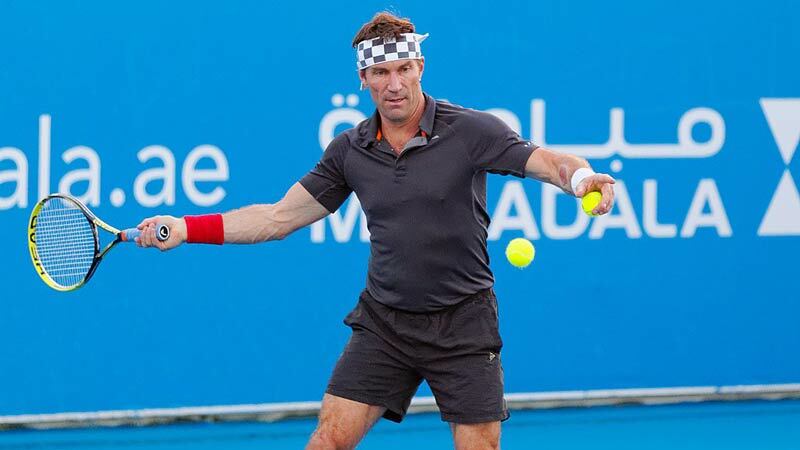 Most player’s backhands are not as strong as their forehand. This is because it’s more difficult to achieve the same level of racket speed on the backhand wing as the forehand side. However, some players do have better backhands than forehands. If you’re one of those players, then you’re fortunate. Most club players dread hitting their backhands. I find that most women have better two-handed backhands than forehands. This is likely due to them using more of their core and legs on the backhand. For men, I find most have much better forehands. The backhand can either be hit with one hand or two. Examples of players with one-handed backhands are Roger Federer, Stan Wawrinka, Carla Suarez Navarro, and Justine Henin (now retired). Some would argue Henin had the best one-handed backhand in the women’s game. 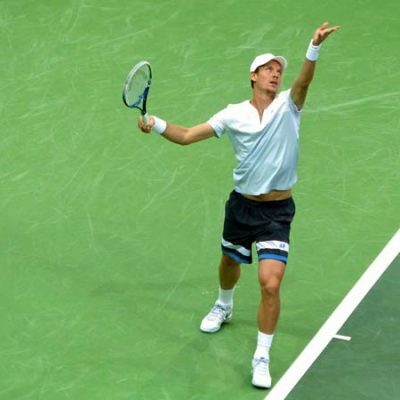 The one-handed backhand offers some pros an advantage over the two-handed backhand. The pros using the one-handed backhand would have greater range of motion, slightly more drive and power, and more versatility with spin. The cons of the one-handed backhand (compared to the two-) are less control, it’s more difficult to hit high shots, and there’s less ability to hit the ball late. Additionally, it’s more difficult to return serve with a one-hander. These cons are enough to have persuaded most players and coaches to only teach and hit the two-handed backhand. For this reason, most of the players on the pro level (for both men and women) use a two-handed backhand. If you wish to reach the upper levels of tennis, it’s essential you develop your backhand into a reliable shot. You’ll need to be able to hit it with depth, spin, placement, and a decent amount of pace. While it’s not essential you smash winners from the baseline with your backhand, it is essential that it keeps you in the rally. Most professional players use their backhand to stay in a rally long enough to set up their forehand. If you wish to learn the backhand, I suggest the two-hander. Get a qualified coach to teach you the basics of the shot and then just keep practicing it. I have videos on my youtube channel showing how to hit both the two-hander and the one-hander. 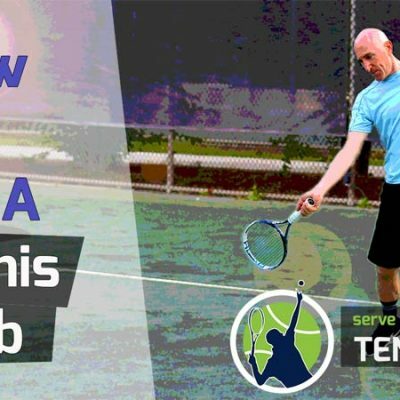 Along with the forehand and backhand, the serve is one of the three primary shots in tennis you must know to begin playing. 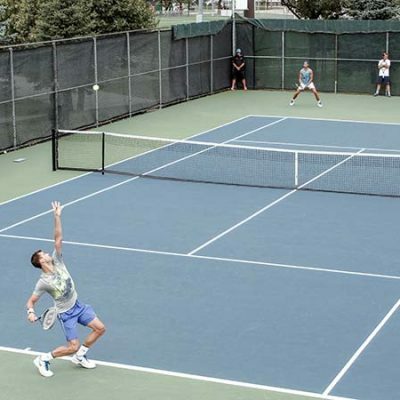 If you can effectively execute all three shots, you can play tennis. The next shot in tennis you should learn is the volley. If you know these four shots (forehand, backhand, serve, volley) you can play matches, even in tournaments. 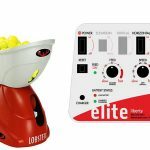 It sounds amazing, but you can literally choose to avoid the other four basic shots (drop shot, overhead, slice and lob) and still play competitive tennis. I wouldn’t suggest it though. All tennis players (whether in singles or doubles) get two serves on each point. The first serve is usually hit flat and hard. The second serve is often hit with topspin or kick. These types of serves have more margin of error and are about 15-20% slower in speed than first serves. Of the 8 basic shots in tennis, the serve is by far the most difficult to learn and the most complicated. This is for a few reasons. First, the serve is the only shot in tennis where you start and finish the stroke. All other strokes rely on the ball coming to you. Second, the serve requires you to toss the ball high in the air (usually twice your height) and strike it on the way down. This requires split-second timing. The toss can also be problematic. This is because it’s done with the non-dominant hand, which can be very difficult for uncoordinated people and beginners. 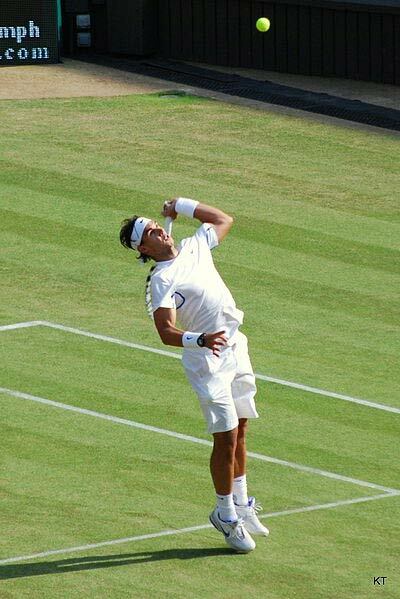 Third, the serve is a complicated series of movements that must be performed in about two seconds. It also requires knee-bend, flexibility, and high racket speed. Due to these factors, many club players never develop anything beyond a mediocre serve. This means their serves typically don’t break the 100-mph barrier or possess enough spin to hurt opponents. 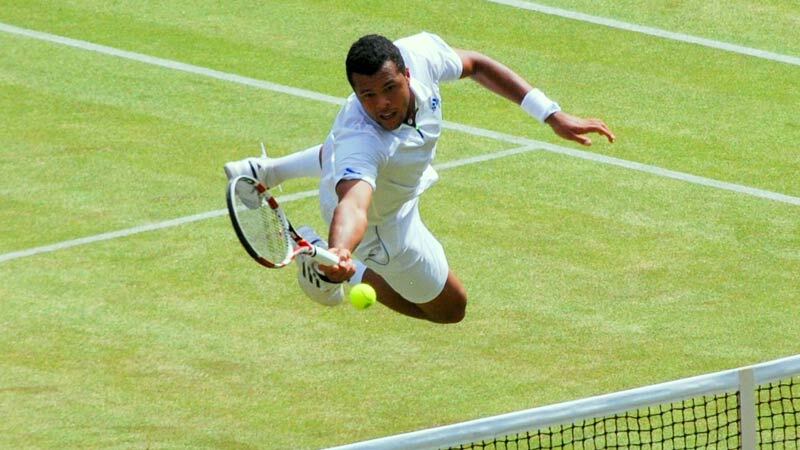 If you are just starting out in tennis, realize the serve is a shot that will take you months or years to master. Everyone is limited on the serve by their physical ability, so be aware of that too. If you have dreams of serving 120-mph, unless you’re young and very talented, it’s not likely to happen. Instead, your goal should be a very consistent serve with excellent placement. The serve is one of those shots you’ll need to continually practice. It requires perfect timing and tremendous hand-eye coordination when hit well. Some of you may just want to play tennis for the exercise, or for the fun. If that’s your goal, you can use a very simple beginner’s serve to get the ball in the box and start the point. If that sounds like you, I would advise you to check out my youtube video on the abbreviated serve motion. 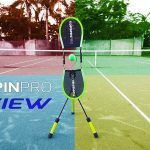 It’s a beginner’s serve, but slightly more advanced, offering more power and spin. For those who aspire to hit their serve like Roger Federer, check out my video on Roger Federer’s serve motion. 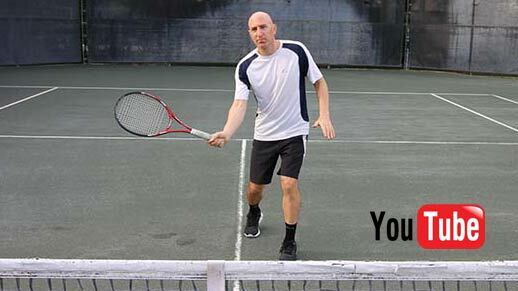 In this video, I explain how to hit your serve like Roger. Just don’t blame me if you can’t. The volley is unique all to itself. At its most basic element, it doesn’t require any swing of the racket or much body movement at all. Yet, it can be one of the most difficult shots in tennis to master. What is a volley? A volley is when a player hits the ball directly out of the air, instead of letting the ball bounce first. When the ball bounces first, it’s called a “rally”. When taken in the air, it’s called a volley. The volley is a very short compact “block” of the ball, most often close to the net. The volley can be hit on either the forehand side or the backhand side. One of the reasons so few players master the volley is the very short amount of time provided to hit the ball. When you’re up at net, the ball is coming to you much sooner than at the baseline. This makes it largely a reflexive shot, while baseline groundstrokes are much more deliberate. Even the best players in the world today prefer not to come to net. The pace of groundstrokes at the pro level is just too much to handle, even for the best volley players. With groundstroke speeds coming in excess of 80-90 mph, it’s very difficult to hit effective volleys, much less get a racket on the ball. For this reason, we have seen a trend away from net play over the last generation. 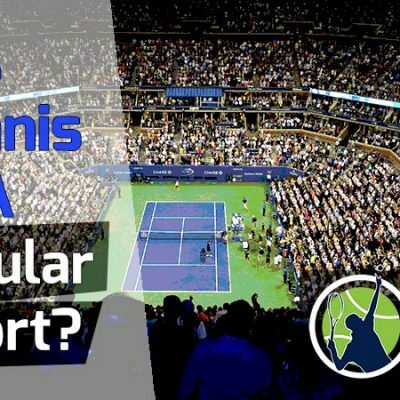 If you want to read more about this, I wrote an article entitled Why Did The Serve And Volley Die Out? It’s an interesting look at why the volley declined in both the women’s and men’s game over the last 20 years. Despite the volley dying out, all players must learn to volley. This is because if you’re forced into net, you’ll have no choice but to eventually volley. The volley is also an essential part of doubles, which many people play. If you’ve been struggling with your volleys, have no fear. 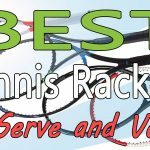 I wrote a great blog post about the 7 types of volleys to use in your game. By knowing all 7 types and how to hit them, you’ll instantly improve your net game. I also have a bunch of volley videos on my youtube channel. I recommend starting off with the block volley and then working your way through the other 6 volley types. On the volley, always remember less is more. Most people over-complicate the volley and do too much swinging. The volley is more about great footwork and less about what you do with your racket. If you want to play good doubles, or be an offensive player in singles, it’s imperative you learn to hit volleys with pace, spin, touch, and placement. It all comes in time. Traditional forehand and backhand strokes are hit with topspin (forward rotation of the ball). However, the slice employs backspin, which is a backward rotation of the ball. Interestingly, it can also involve side spin. The slice can be hit on either wing: the forehand or backhand. It can also be hit with either two hands or one. However, most players (probably more than 95%) hit their slice with one hand. The slice generally refers to the downward motion of the racket when contacting the ball. The downward motion is what causes the backspin on the ball. This is in contrast to traditional groundstrokes, which use a low-to-high swing path. In my opinion, it’s more difficult to learn the slice though. I can teach a child or adult to make solid contact on a traditional forehand or backhand, but the slice is a different animal. For this reason, it can take a long time to develop a penetrating, effective slice shot on both wings. One of the reasons for the difficulty level is the downward motion of the swing. Most beginners aren’t used to contacting the ball like that. The continental grip used on the slice also throws people off. 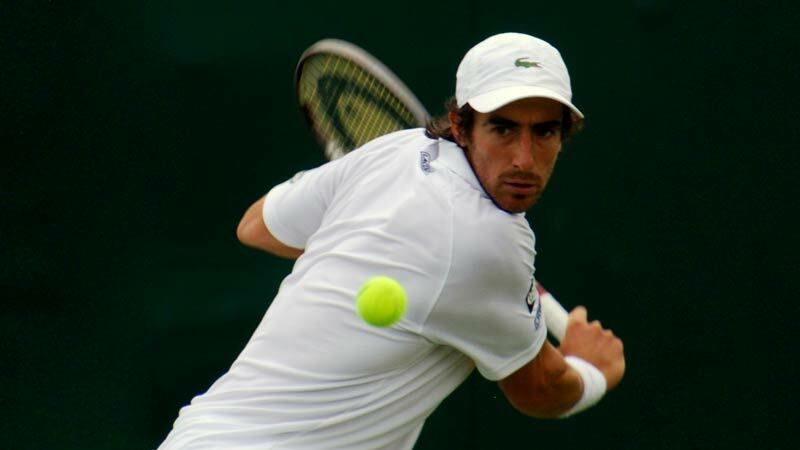 Most players open the racket face too much, or too early, and float the ball on their slice. For this reason, I teach my students to hit the ball completely flat but with a high-to-low trajectory of the racket. If the slice is hit well, it can be a very damaging shot to the opponent. A good slice will skid on the ground and stay low. It can also be difficult to volley a tightly rotating slice. Most players use the slice as a defensive shot, but it can certainly be used offensively as well. One example of an offensive slice shot is the approach shot. This is a hard, low slice away from the opponent. On an approach shot, a player will quickly come to net in hopes of putting away an easy volley. The former greats like Pete Sampras, Patrick Rafter, and Stefan Edberg all used this tactic. Many players also use the slice on the return of serve. I find the slice to be an excellent way to neutralize fast serves. It’s also much easier to control a slice return than a topspin return on fast or high serves. The downside of returning a serve with a slice is that your opponent could volley it for a winner. But that’s only if they are a serve and volley type player. If you’re playing a strict baseliner, it’s a good tactic for the return. The slice is an excellent way to handle high shots too (balls higher than your shoulder level). This is especially true on the backhand side, where there is less flexibility and strength to hit the ball high up. For this reason, you’ll see many professional players turn to the slice on the high backhand. I personally use the slice to great effect on my forehand wing too – mostly on high shots. The slice is also a great way to change up the spin on the ball. In this way, you offer different looks to your opponent, so they never know what to expect. Lastly, the slice is often used as a last resort when the ball is far from the body. This typically happens when a ball is hit far from us and we are on the run to it. Being it’s nearly impossible to hit a traditional groundstroke when so out of position, players will simply slice the ball back, as it’s the only option. When done on the forehand side, some call it a “squash shot”. Roger Federer probably hits the best “squash shot” in the game. He also has one of the best slices the game has ever seen, period. If you play tennis but haven’t developed a slice – or a good slice – work with a coach who can show you the shot. I have a great blog post here on how to hit a backhand slice. I’ll be adding one for the forehand slice soon. The overhead is a shot you hit above your head. It’s very similar to the serve motion, except the ball will be hit at you, instead of you initiating the stroke. Overheads can be hit directly out of the air or after they hit the ground. If taken out of the air, exquisite timing is necessary to hit an effective overhead. On occasion, it’s wise to let the ball hit the ground first and not take it out of the air. If the ball bounces high enough, you can strike the ball over your head. Allowing the ball to hit the ground first is a lot easier than taking it out of the air. However, most of the time you’ll want to hit the ball out of the air. It’s really a judgment call which one you choose. The more you play, the easier it becomes to decide. You’re much more likely to hit the ball out of the air when you’re at net and lobbed. It’s my belief that if you have a good serve motion, you’ll have a good overhead. The fundamentals of the serve and overhead are basically the same. However, if your serve fundamentals are lacking, your overheads are going to be spotty at best. I believe a good racket drop is crucial to hitting great overheads. The racket drop is when your racket inverts before swinging up to contact. If you have a beginner’s serve, also known as a waiter’s serve, you’ll likely never have world-class overheads. But you can still make do and place the ball well. The overhead requires good footwork and great timing. Most people miss their overheads because their footwork does not put them in proper position to hit the ball well. When you see a ball lobbed to you, your first instinct should be to turn to your forehand side and get your racket up. This is the side from which you hit your forehands and serves. From here, you’ll want to use a cross-step as your first move. Once done, side-step back into position to hit the perfect overhead. A major mistake I often see is people walking backwards to hit the overhead. They clearly missed the first step of turning to their side. This rarely works and can result in you falling over and hurting yourself. With the right footwork and practice, you can make the overhead one of your best shots. If you can put your overheads away with pace and placement, it’ll put a ton of pressure on your opponents – especially when you come to net. I should mention that the overhead can be hit on the backhand side as well. It’s rare, but most professional players can put away balls using a backhand overhead. A lot of it involves a flick of the wrist. 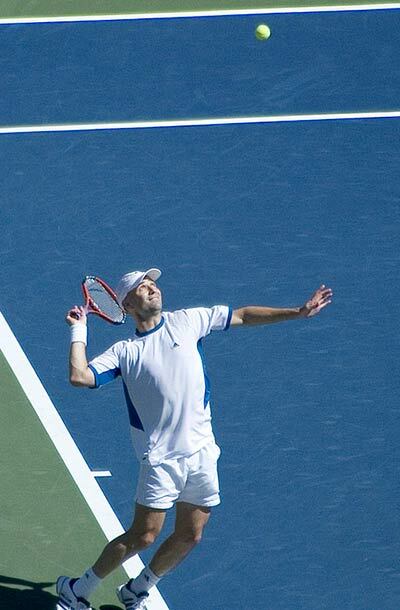 However, most club players find the backhand overhead shot to be very difficult. It’s still worth practicing, as you’ll experience hitting it from time-to-time in your matches. It involves using a combination of your arm and wrist. 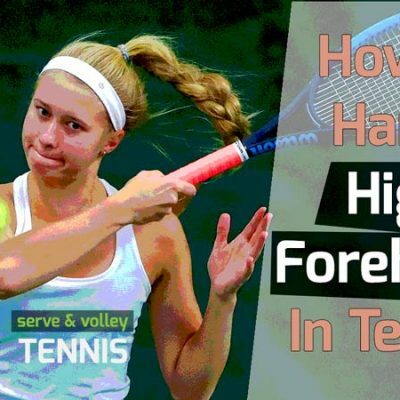 The normal overhead is an important shot to learn in tennis and will serve you well in both singles and doubles. Most people don’t practice the overhead enough. I suggest working on it every practice session, if even for 5-10 minutes. When done right, the drop shot is an extremely effective shot that can win you a point outright. It is often made from the baseline, whereby a player hits the ball very slowly with a lot of backspin. Optimally, the ball will go barely over the net, not more than 5-6 feet into the court, and have very little forward movement. This will force the opposing player to sprint up to the ball and hit it. This causes difficultly for the opposing player for several reasons. One is that the ball may be out of reach, whereby you win the point outright. Second, the opposing player must run fast and stop in time to avoid hitting the net. 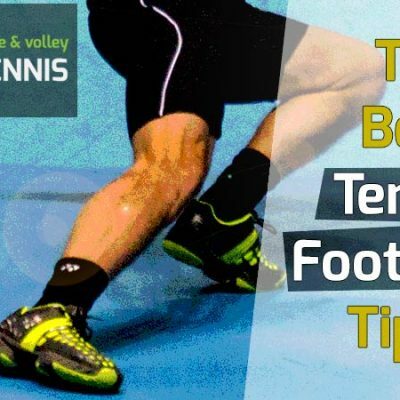 If that player touches the net with their body or racket after hitting the ball, they automatically lose the point. Third, most good drop shots will cause the opposing player to lift the ball over the net, making it difficult to hit a good shot back on you. The drop shot can be hit off either side – forehand or backhand. 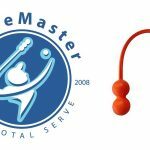 It can be used at any time during the point, even off the serve. As a matter of fact, it can be very effective off the serve. I like to throw in at least a few drop shots per set – usually in my baseline rallies. I do this for several reasons. One, it keeps the opposing player honest; he or she never knows what to expect from me. Second, it makes the opposing player sprint to net, which expends their energy. This makes them just a bit more tired during the rest of the match. I especially like to drop shot my opponent in the first set, as it will tire them out in the second set, and possibly the third (if we go there). If you want to compare it to boxing, drop shots are like body blows. Even if the opponent gets to my drop shot and wins the point, it takes a small physical toll on them. In boxing, a fighter may land body shots early in the fight, but they typically don’t pay off until the later rounds. Same thing in tennis. The drop shot can be used in these different scenarios: off the serve (as I just mentioned), during a baseline rally, and when you’re at net hitting a volley (called a drop volley). Another really good time to use the drop shot is off a drop shot. That last scenario may sound confusing, so I’ll clarify. Let’s say your opponent drop shots you and you sprint up to the net to hit the ball. Usually your best option at that point is to drop your opponent right back. Why? Because it’s often unexpected and your opponent will need to cover a large distance to get to the ball. It’s also easier to drop shot from the net rather than the baseline. The drop shot requires a more delicate touch than any other shot in tennis. If you’re playing against a fast player who anticipates well, you’ll have a slim margin of success with the drop shot. The danger of the drop shot occurs when it’s hit too deep or too high. If this happens, expect your opponent to easily get up to it and hit a clear winner on you. As this can happen, it’s an excellent idea to disguise your drop shot. You do this by making it look like you’re going to hit your normal forehand or backhand. At the last second you pull the rug out from under your opponent and slice the ball short. If you can learn to disguise your dropper, you’ll have a lot more success with it. I think the number one reason players fail when using the drop shot is that they telegraph it. Most have no idea they’re showing their hand a mile away – as their opponents are usually mum to the fact. One more point about the drop shot: It can be a great way to get a baseline player who hates the net out of his element. By dropping such players, you force them to play the net, where their weakest. This is a great strategy to use against a perennial baseline player. Practicing the drop shot is quite easy. Just rally at the baseline with your hitting partner. After one or two shots, hit a drop shot. You can also practice it on a ball machine. The lob is chiefly a defensive tennis shot. In tennis, a lob is a slow-moving shot hit at a high trajectory. Its purpose is to go over the head of a net player – or make the net player hit a difficult shot. Some people even go so far as to use the lob in rallies. While that can work at the lower levels of tennis, it doesn’t work at the intermediate level – and certainly not at the advanced level. I suggest only lobbing when the opposing player is at the net or when you’re far out of position and off the court. The latter works well to give yourself time to get back into the point. Lobbing when you’re off the court is especially effective if the opposing player doesn’t like to move off the baseline. I use this tactic a lot when I’m strung wide against a perennial baseline player. The lob can be hit off any side, forehand or backhand. It is most often hit with topspin but can be hit with slice as well. A topspin lob is much preferred and more effective for three distinct reasons. One is that the topspin will help keep the ball in the court. Two, it’s more difficult for your opponent to hit a fast spinning ball that is dipping quickly; slice shots tend to float more and are much easier to hit. Lastly, you can lob with more pace and margin of error with a topspin as opposed to slice. To hit the lob, simply brush on the bottom of the ball and finish your stroke up high. You’ll be taking almost all the pace off the ball and putting that energy into the “brush”. Keep in mind it’s always more effective to lob your opponent on his or her backhand side. The backhand overhead is a much tougher shot to hit than the normal overhead. You can make the lob more even more effective if you disguise it well. Do this by preparing the same way you would on any forehand or backhand. Instead of hitting with your normal stroke, put a lot of brush on the ball. Lobbing is a good strategy but it’s not the cure-all to beat a player that likes to come to net on you. Instead, it’s best to mix in hard shots and heavy topspin shots with your lobs. This throws your opponent off and will keep them guessing. If you’re playing outside and it’s very windy, take note of which way the wind is blowing. My best advice on a windy day is not to lob into the wind. I find it to be very challenging to hit a lob when the wind is against me. If I lob into the wind, the ball will not be very deep, and my opponent will crush it. On the contrary, lobbing with the wind is advisable. You just need be careful not to put too much on the ball. When hitting a lob with the wind at your back, hit lightly and let the wind do the work. You can practice your lobs as easily as your drop shots. Just have someone stand at the net and see how well you can lob them. Practice over-and-over on both forehand and backhand wings. Do this until you’re a master of the topspin lob off of both sides. This wraps up the 8 basic shots in tennis. 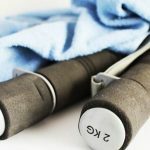 I hope this post has given you a good insight into each stroke. My point was to give some information on each stroke to all level of players. If you’re new to tennis, take your time learning each stroke. Tennis is a difficult game to learn and master. Give yourself several years to reach an intermediate level. For those experienced players reading this, if you’re not using all 8 basic shots in your game, you’re selling yourself short. For example, if you’ve never sliced, or don’t believe you can do it well, take on the challenge of learning it. It will add great depth to your game. Remember, always make sure you know the fundamentals and are executing them properly. If you can’t get a coach, at least video your strokes so you can see where corrections need to be made. Hey, I have a lot of cool and interesting articles on this blog, so don’t be afraid to browse around and check them out. I’ve categorized most of them into “training” and “theory”. Thanks for coming this far with me. If you have any questions on these basic strokes of tennis post them in the comment section below. And don’t forget to check out my youtube channel for great tips and tricks to accelerate your tennis game.